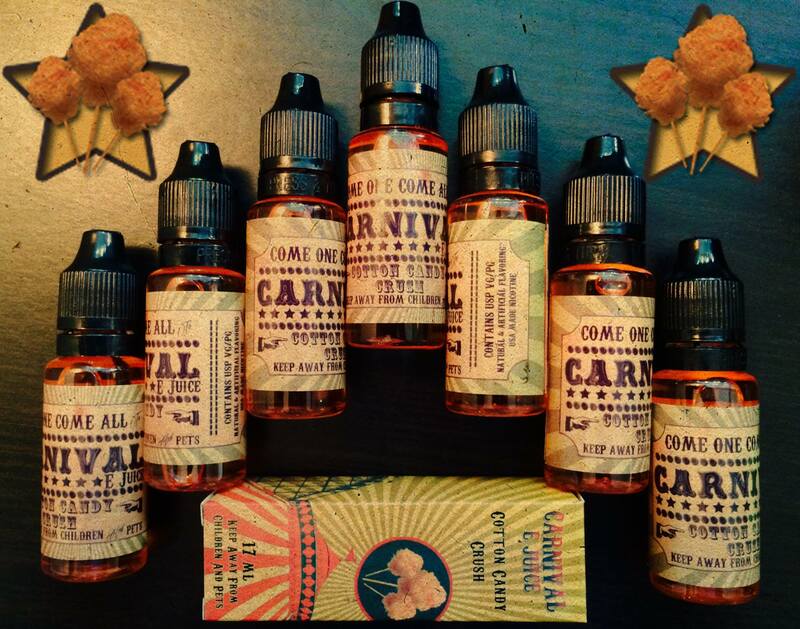 Carnival E-juice based in the state of California USA have sent me their current line up of show-stopping flavours for review that is made up of no less than five unique flavoured combinations, all of which are appropriately named, helping to conjure up the imagination. If you like it fruity, then this is a range for you to consider. I have reviewed these juices over a period of two weeks on two different manufacturers VV/VW devices as I normally do in these reviews. These include the ProVari 2.5, and the eVic Supreme. I have also used a combination of three different tanks. 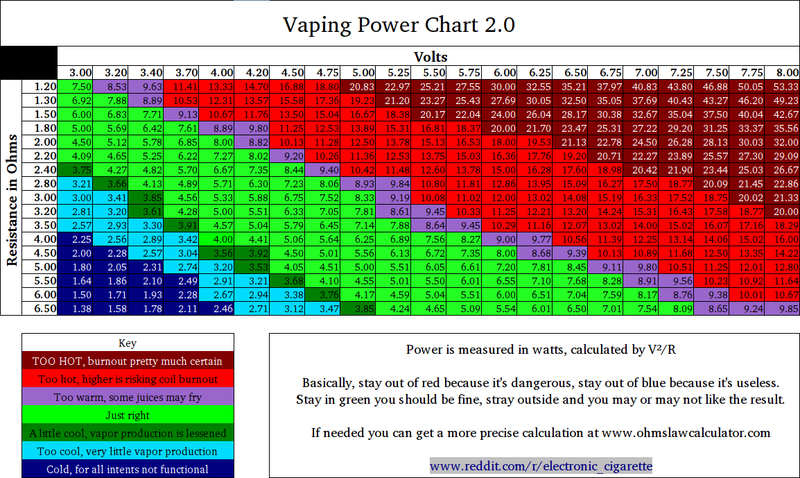 The new Kangertech Aerotank Mega & Mini, plus the Aspire Nautilus, in varying combinations, using the ranges suggested in the chart supplied here for added consistency. Each juice comes in a 17ml well designed and clearly labelled bottle, using USA made nicotine strengths ranging from 00mg 06mg 08mg 12mg & 18mg, each juice using a combination of both VG/PG 50/50. Using a selection of wild berries including blueberry and blackberry, with the added flavour of a delicious Strawberry, you have a refreshing and revitalising combination providing a full fruit flavoured vape, in order to cool the temperature on a hot summer’s day. 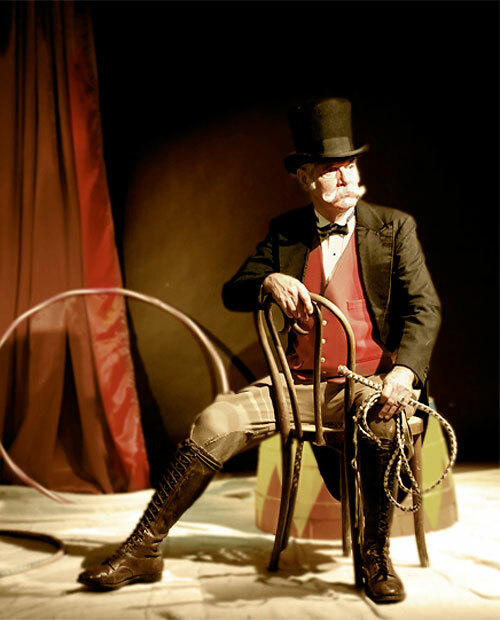 One of the most famous Carnival attractions and popular with all children from the 70’s to the current day is without doubt Cotton candy, also known as the Fluffy stuff, Candy floss, or the Tootsie roll. Added to this blend is a hint of sweet berry, and now you’re left with the clear impression of that sweet tasting fluffy pink candy on a stick with added flavour and goodness. All the fun of the fair! Enjoy a tropical fruit punch? Then this is the juice for you. With a mix of Pineapple, Strawberries, Raspberries, Mango and Apple, you cannot fail to be impressed by the subtle hints of all these flavours combined. A magnificent tropical paradise vape. A simple but effective blend of orange and strawberry combined, leaving a pleasant sweet-tasting citrus flavour on the palate. The addition of the strawberry helps to reduce the sharpness usually found with orange on its own, making for a more enjoyable vape. An interesting mixture of Strawberry that follows the Banana, with another added mysterious essence that keeps the taste buds guessing, inviting you back time and again to discover exactly what it is. If you enjoy a cooling fruit Smoothie, you will be sure to enjoy this as well. 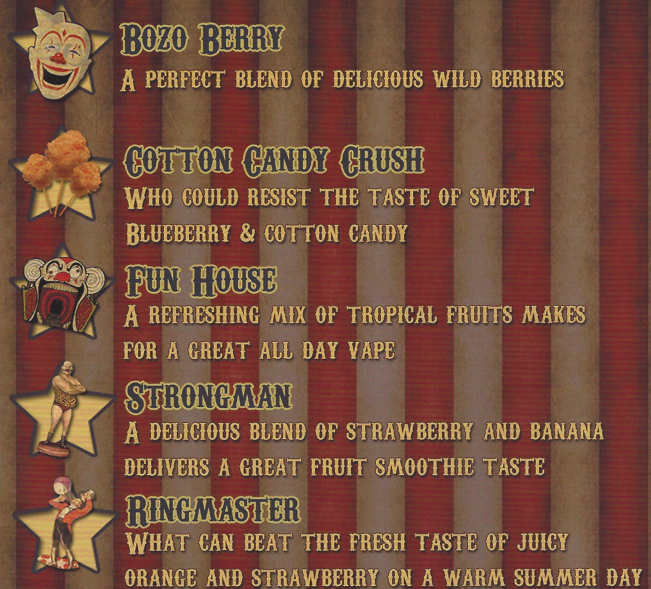 Carnival has provided a splendid selection of original flavours, in a well-suited combination. Their attention to detail is not only present in the blending of their juices, but in the design of the packaging as well. For me, I think it is the best I’ve seen so far, and their design team should be commended for the detailed work they have put into these. 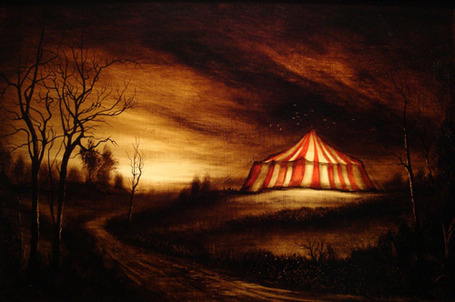 They look fantastic in my opinion, bringing back the feeling of a time when Carnivals were at their height. Individual flavours are easily recognisable as I have mentioned in the review, and vapour production, as you would expect from a quality juice, is extremely good too. I used a Nicotine level of 18 when reviewing these, so throat hit was clearly present, and what I would have expected. All labelling on the individual boxes is clearly printed, and a bar code label introduced on the base of each box taking you directly to their website, along with a safety warning for children & pets. One thing that could be added to the information is the PG/VG percentage for each juice, currently 50/50. A small thing I know, but important for the consumer. It will help by including this balance on the Home Page section of the website too. Delivery was made on time from the USA to me here at Vape On Watt Reviews, based in London UK, and all juices were individually bubble wrapped for added protection, arriving safely in one piece, or five to be exact! 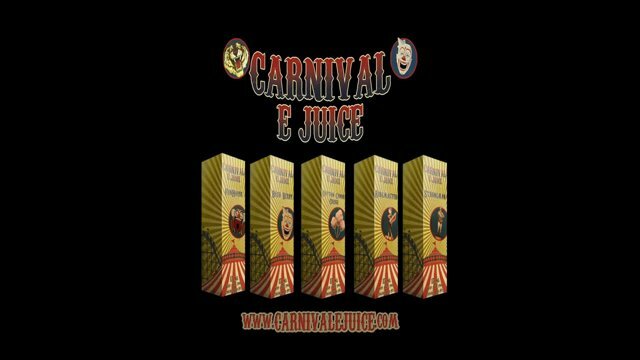 They have created a very classy website too for orders online and information on each of their current line of juices. I’m sure they will produce more choices in the coming months ahead, and I hope to update this review for you when they do. Personally, I’m looking forward to a Toffee apple flavour and creamy fudge as well. 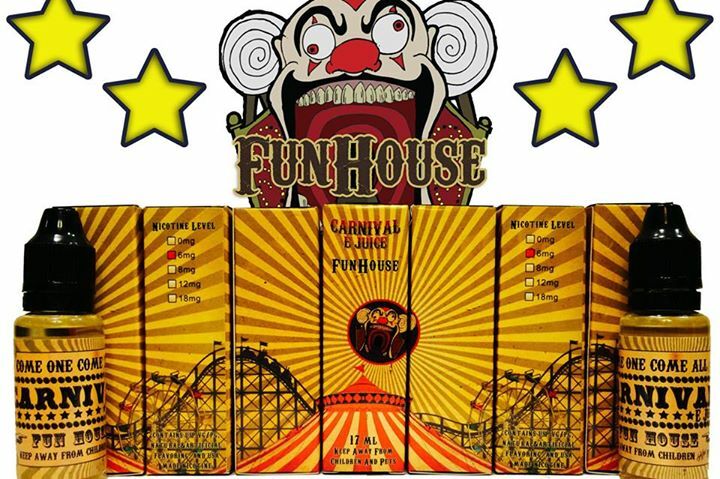 This range is no sideshow at $12 each or $60 for the complete set of five. So If you’re looking for an eye-catching design, holding a genuine mouth-watering selection of E-juices, then step right up! For further details on the Carnival range, please use the contact information provided below. Or call California USA (888)439-2899.